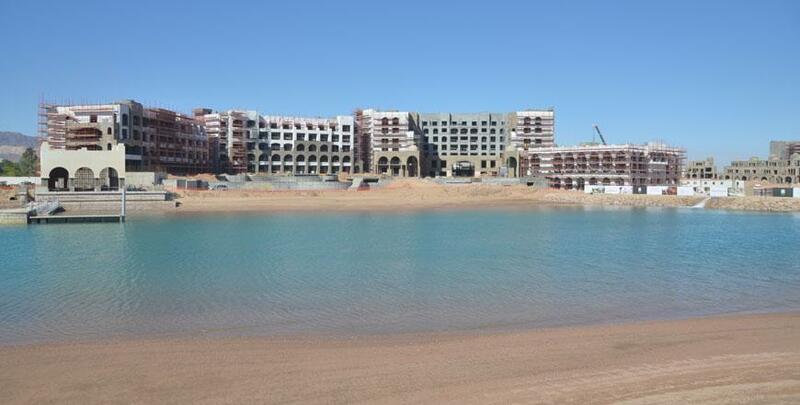 A major new development that’s set to transform Jordan’s only coastal city has chosen high performance Gyproc wall, lining and ceiling systems for its Phase 1 staff accommodation buildings. Saraya Aqaba is a new US $1 billion tourist destination and regional business hub that is being developed around a giant man-made lagoon at Jordan’s Gulf of Aqaba, on the red sea coast. It will provide 800 new villas and apartments and 4 world-class 5-star hotels, as well as a new retail centre, international restaurants, a conference centre, Water Park, beach club and an amphitheatre. As part of the first phase of the development, which includes much of the hotel and leisure development, as well as residential buildings and infrastructure, General contractor Drake & Skull Construction, is providing the accommodation facilities for site staff. To meet tight delivery and cost targets for the accommodation, the decision was taken to use Gyproc lightweight metal systems in place of slower, and ultimately more costly, blockwork alternatives. A range of Gyproc systems, including Gyproc CLASSIC partitions, GypLyner wall linings and Gyproc MF ceilings are therefore being used in combination to meet the client’s demanding minimum standards of fire resistance and acoustics. Working closely with the architects and contractors, Gyproc’s technical team developed a complete internal linings package that achieved all of the required performance standards utilising only single layer plasterboard linings, which minimised material and wastage on site, maximised available room space and helped the contractor to provide a competitive price for the project. Because of the dry installation technique, which does not involve the ‘drying out’ delays associated with heavy masonry systems, internal walls and linings will be completed quickly and efficiently, allowing early access to follow-on trades and contributing to a significantly shorter overall build time for the new accommodation facilities. Effectively a ‘city within a city, the new Saraya Aqaba development, which has been designed in culturally authentic style to complement the existing surrounding ancient architecture, will not only provide a major tourism and business boost for the area, but will add a further 1.5 km of beachfront to the City.